Fort Loramie’s Marissa Meiring spikes towards two Miami Valley Christian Academy players during a district final match on Oct. 28, 2017 at the Trojan Activities Center in Troy. Meiring is one of four returning starters for the Redskins, who have their top three leaders in kills from last season back. 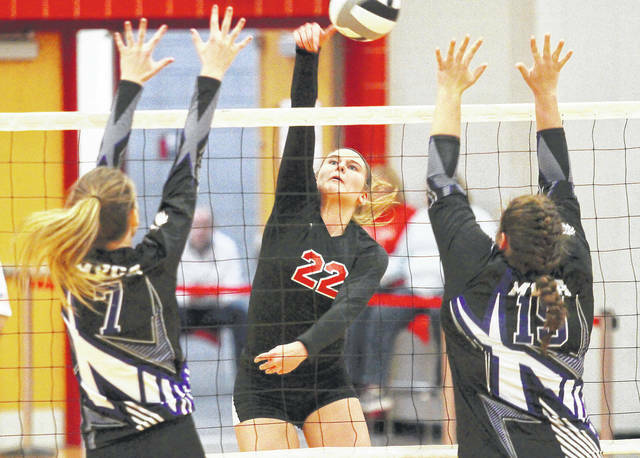 FORT LORAMIE — The Fort Loramie Redskins will find out in a hurry just how they match up against some of the area’s top volleyball teams. And the Redskins, who graduated eight seniors from a regional finalist team, have no plans on slowing down. Loramie coach John Rodgers is optimistic the Redskins can again contend for the Shelby County Athletic League title and make a deep postseason run. The first test comes during the season opener when Coldwater hosts teams like Fort Loramie, Versailles, Miami East and St. Henry. The first four teams all reached regional finals. St. Henry reached the Division IV district final before losing to eventual state champion New Bremen. Fort Loramie gets St. Henry in its opener. “You can come out of there 1-2 and be a state champ,” Rodgers said. State-caliber talent returns for Loramie, especially at the net. The Redskins return their top three leaders in kills. Junior outside hitter Marissa Meiring led Loramie with 225 kills, sophomore middle hitter McKenzie Hoelscher added 190 and senior outside hitter Chloe Stang 160. Hoelscher led the team in blocks (53). She and Meiring (18) are the only returning players who reached double digits last season as four graduated seniors accounted for 138 blocks. Stang led Fort Loramie in digs (301) and senior libero Emily Austin was fourth (265). The Redskins also deliver some pop from the service line as Meiring was second in aces (46), Hoelscher third (42) and Stang fourth (30). As for holes to fill, one of the team’s biggest graduation losses came at setter where 809 of the team’s 964 assists came from a senior. But, Rodgers said, the roster is deep at every position and competition for playing time “has been tremendous.” That will help contend for the SCAL title. Loramie, 17-11 overall last season, finished tied for second with Russia at 9-3. Anna won the SCAL at 10-2. Loramie beat Russia 3-1 in the Division IV regional semifinals before falling to eventual state champion New Bremen in four sets, winning the first one 25-19 before dropping the next three 20-25, 13-25, 17-25. Meiring, Hoelscher, Stang and Austin enter with the big stats from last season. But much like last season Rodgers doesn’t want to focus the offense around one person. The team approach is again emphasized for the Redskins. “One of the things we’re stressing is we want everyone involved,” Rodgers said. Especially facing a tough season opener against St. Henry at Coldwater’s tournament. And don’t forget that loaded D-IV postseason field. Loramie’s regional has produced the last 11 state champions. Fort Loramie qualified for its third consecutive Div. III state cross country meet last season after winning the Troy D-III regional meet. But the Redskins finished seventh in the state meet — far below their expectations after winning the title in 2016. Coach Dennis Prenger said the disappointing end has fueled the squad’s offseason training and motivated them to aim for gold this season. With two of Ohio’s best D-III runners back, a state title could be within the squad’s grasp. The Redskins return five letterwinners from last year’s squad, including seniors Joe Ballas and Jake Rethman. Ballas was first team all-Ohio last year and won the regional race in 16:19. Rethman was second in the regional in 16:23. “I like to think we have one of the best one-two punches in the state in Jake Rethman and Joe Ballas,” Prenger said. Other returnees include senior Gavin Schulze, junior Jordan Drees and junior Evan Luthman. Senior Charles Wray will join the varsity squad, and Prenger said he hopes Wray will have a breakout season. The rest of the program’s roster is made of juniors Nathan Hess, James Keller and Kaden Mescher along with sophomore Jason Chaney and freshmen Evan Eilerman, Colin Gasson, Colten Gasson, Trey Ranly and Isaiah Scheer. The freshmen helped the Redskins’ junior high squad finish second in the SCAL race last year. Prenger expects a tough fight for the SCAL title this year. The Redskins will look for another trip to state after finishing fourth in Div. III last year. They return all runners from last year’s team and will aim to win the title this year. “We are extremely excited about the future as the freshman class that is being added to a core of talented runners and can help us build around this season and into the future,” Prenger said. Leading Fort Loramie’s returning letterwinners is junior Danielle Berning, who finished 27th in the state meet last year with a time of 19:43. Also back are senior Erin Chaney, juniors Paige Rethman and Hannah Siegel and sophomores Dani Eilerman, Caitlyn Gasson, Clara Gephart, Corynn Heitkamp, Angel Rodriguez and Maddie Simon. The rest of Fort Loramie’s roster is made of sophomores Reece Boerger, Claire Chaney, Ellie Holthaus, Kelsi Holthaus, Jada Mescher and Hailey Sherman along with freshmen Elsie Beresik, Olivia Borchers, Anna Detrick, Kaitlyn Grillot, Claire Rethman and Elizabeth Shatto. The Redskins’ freshman helped the middle school squad finish first in the SCAL race last season. With many other SCAL teams returning their top runners, Prenger said he looks for the league race to be competitive. Fort Loramie is hoping to compete for the SCAL title this year with three of its top four golfers returning from last season’s squad, which won the league with an 11-1 record. Junior Zach Pleiman led the squad with a 41.67 average last year. Seniors Mitchell Puthoff (42.63) and Eli Rosengarten (44.87) also return. The Redskins are unexpectedly looking for a fourth golfer. Senior Jared Middendorf was expected to fill that role but he injured his back over the summer and won’t be able to play with the team. A group of five sophomores will look to fill that role: Devin Ratermann, Caleb Meyer, Carson Barhorst, Trevor Middendorf and Alex Knouff. “They all got some valuable time in playing some JV matches last year, but we’ll be relying on them to make the jump into varsity and have an impact on this team from the get-go,” Turner said. Fort Loramie finished second in its sectional tournament a year ago to qualify for districts, where it finished seventh. Turner, who is entering his 11th season as Fort Loramie’s coach, expects Jackson Center and Anna to compete for the SCAL title as well. He said Botkins’ Nick Fischio is the favorite for the league’s player of the year. Turner said other top area Division III teams are Newton, Twin Valley South and Minster. Fort Loramie has four returning letterwinners off of last year’s team and is looking for success in its first season of Cross County Conference play. If postseason success is any indication, the Redskins should be among the CCC’s top squads. Fort Loramie finished second in the Division III sectional meet last year to earn a district berth. Seniors Amy Eilerman, Riley Middendorf, Rylee Poeppelman and junior Savannah Henning return. Eilerman was the team’s most valued player last year, while Middendorf and Poeppelman are three-year letterwinners. Key newcomers include sophomore Megan Eilerman and freshmen Eva Bolin and Rheese Voisard. “We have had a good start, but the season is not over and we need to improve where we are able,” Hollenbacher, who’s entering his second season, said. “We are fortunate in that we have 13 girls that came out for golf this year and are able to have a JV team — which is great. Freelance writer Greg Billing contributed to this article. This entry was tagged 2018, Alex Knouff, Amy Eilerman, Angel Rodriguez, Anna Detrick, boys cross country, boys golf, Brad Turner, Caitlyn Gasson, Caleb Meyer, Carson Barhorst, CCC, Charles Wray, Chloe Stang, Claire Chaney, Claire Rethman, Clara Gephart, Colin gasson, Colten Gasson, cross country, Cross County Conference, Dani Eilerman, Danielle BErning, Dennis Prenger, Devin Ratermann, Eli Rosengarten, Elizabeth Shatto, Ellie Holthaus, Elsie Beresik, Emily Austin, Erin Chaney, Eva Bolin, Evan Eilerman, Evan Luthman, fall sports, Fort Loramie, Gavin Schulze, girls cross country, girls golf, golf, Hailey Sherman, Hannah Siegel, high school, high school fall preview 2018, Isaiah Scheer, Jada Mescer, Jake Rethman, James Keller, Jared Middendorf, Jason Chaney, Joe Ballas, John Rodgers, Jordan Drees, Kaden Mescher, Kaitlyn Grillot, Kelsi Holthaus, Kreg Hollenbacher, Maddie Simon, Marissa Meiring, McKenzie Hoelscher, Megan Eilerman, Mitchell Puthoff, Nathan Hess, Olivia Borchers, Paige Rethman, prep, preview, Redskins, Reece Boerger, Rheese Voisard, Riley Middendorf, Rylee Poeppelman, Savannah Henning, SCAL, Shelby County Athletic League, Trevor Middendorf, Trey Ranly, Volleyball, Zach Pleiman. Bookmark the permalink.